The 2014 edition of the EOS, conducted between February and May 2014, for the first time included a question on the risks of biggest concern. More specifically, respondents were asked to select the five global risks that they were most concerned about for doing business in their country and to rank these five risks from 1 (for the one of highest concern) to 5 (for the one of lowest concern). 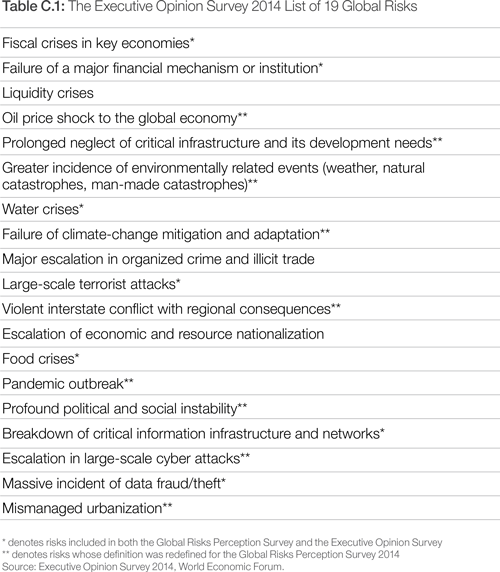 This list of 19 global risks (Table C.1) in the EOS is different from that used in the present report, although a majority of risks on the former list do appear on the latter, albeit slightly reformulated in some cases. The EOS list was established before the Global Risks Perception Survey (GRPS) methodology was reviewed and a number of risks were redefined or excluded and others were introduced. In addition, whereas the GRPS was agnostic about the impact of global risks on a particular group, the EOS question specifically asked about the impact on the ability to do business in the respondent’s country. Furthermore, the EOS did not specify any time horizon, unlike the GRPS which considered a 10-year horizon. Finally, the size and nature of the two samples of respondents differed significantly: a multistakeholder group of experts in the case of the GRPS and business executives in the case of the EOS. For these reasons, the results of the GRPS and EOS are not strictly comparable. Instead, the EOS results provide a complementary perspective – that of businesses on the impact of global risks on their businesses. Figure C.2 reports the results at the global level, as well as for the two main development status groups, advanced economies and emerging market and developing economies.7 Aggregate scores correspond to the average scores of each risk across all economies belonging to the group of interest. Figure C.1 shows a snapshot of the data on a map. Based on the results, fiscal crises is the risk of highest concern for doing business in 93 (65%) of the 144 economies covered by the survey, well ahead of oil price shock and profound political and social instability, both of which come first in 13 economies (9%). The map in Figure C.1 is shaded according to the risk of highest concern. Within a troubled geopolitical context, a fragile and uneven recovery in advanced economies, and a slowdown in many emerging economies, it is not surprising that economic risks are those of most immediate and highest concern to businesses. 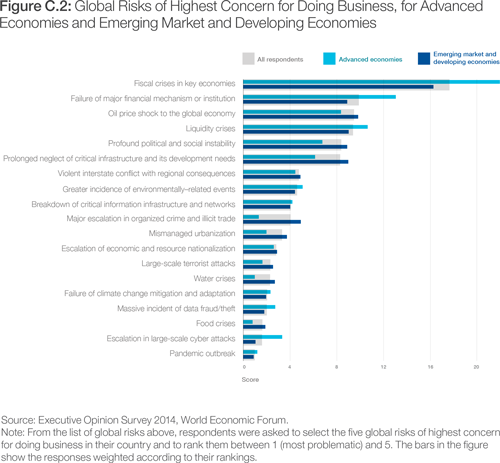 In advanced economies, concerns about economic risks are even higher. 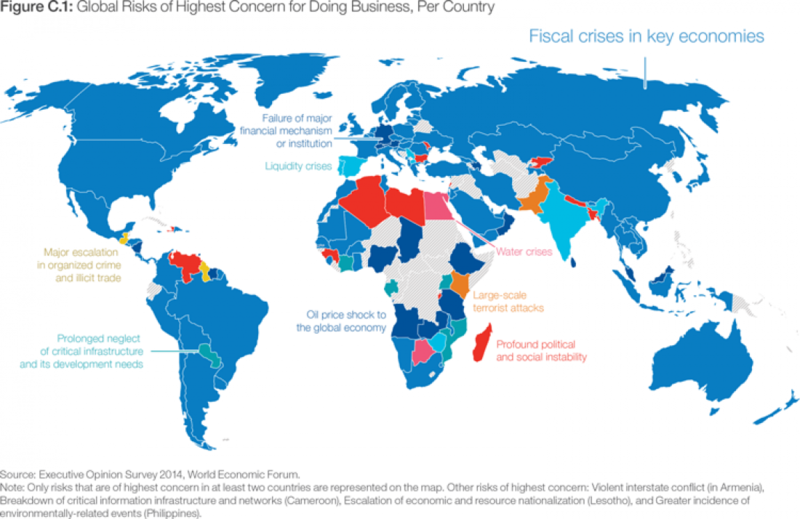 Fiscal crises is the risk of highest concern in 30 of the 35 advanced economies. In Austria, Germany and Switzerland, failure of a major financial mechanism or institution is the one of highest concern, whereas liquidity crises is the risk of top concern in Portugal and Spain. Among emerging market and developing economies, fiscal crises is the risk of highest concern – by far – but oil price shock comes second, followed by liquidity crises. Prolonged neglect of critical infrastructure ranks fourth; a major obstacle to business development, economic integration and trade performance, it is the main concern in Côte d’Ivoire, Mozambique, Paraguay and Uganda. Interested readers can visit the Global Risks report’s portal at www.weforum.org/risks to access the results for individual economies and regions. 5 For more information about the Survey, see Browne et al. 2014. 6 By construction in each economy, the sum of risk scores is therefore 100. 7 Development status classification is from the International Monetary Fund (situation as of April 2014).